Touching down at Pearson airport, we quickly made it through customs and found ourselves searching for the Union-Pearson Express, a light-rail train that runs between Pearson Airport and Union Station in the heart of Toronto's downtown entertainment district. 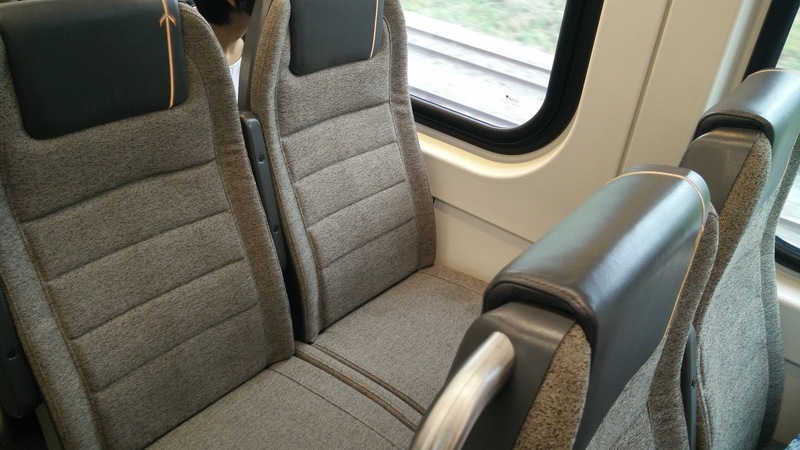 Ticketing was straight forward enough and the train itself looked very new and was very comfortable. With free WiFi and plentiful charging ports, I was able to take care of a few work related items that I needed to get done in the brief 15 minutes in transit between the airport and downtown. Once again, having lived in DC, Boston, and LA in recent years, I lament how none of these cities has managed to provide such a simple, effective, and inexpensive option for traveling between their major international airport and the heart of the city. 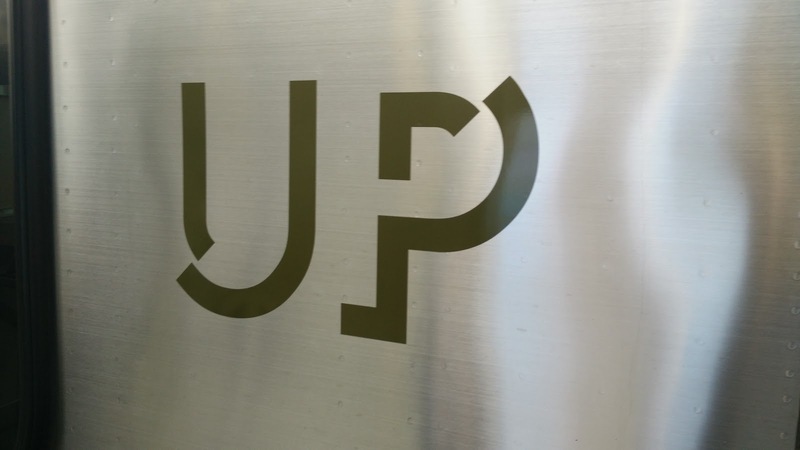 Upon arrival at Union Station, we were able to easily follow signs to get ourselves down to the Metro, though we encountered our first of what would be a few hurdles during this trip. 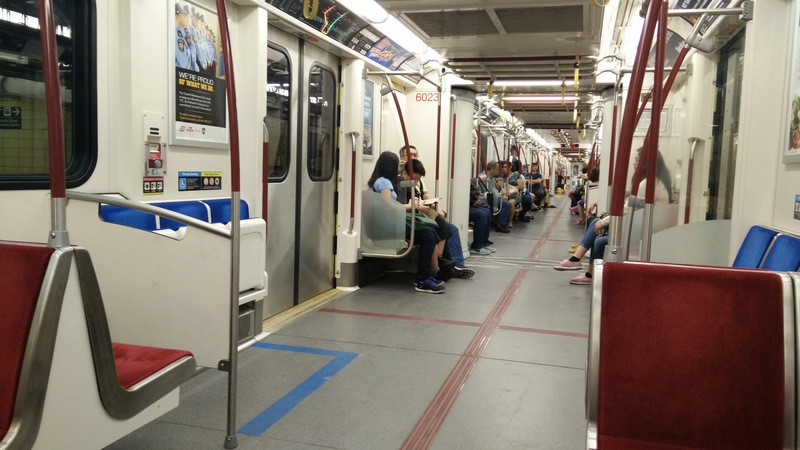 Toronto's Metro allows for fare payment via currency, tokens, and PRESTO cards. 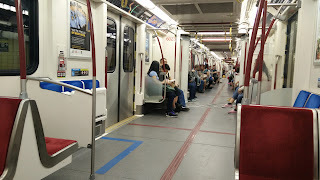 Since we did not have PRESTO cards and did not have exact change in currency, we had to opt to purchase subway tokens. However, the system to make such purchases seemed rather antiquated because credit card purchases were largely unavailable at automated kiosks and we ended up going to a station manager's window to use our credit cards to purchase tokens. However, there was a minimum number of tokens required for a credit card purchase, so we ended up with several more than originally anticipated. Luckily, this hurdle did not actually delay us too much and before long, we found ourselves in bustling Dundas Square. The subway is not the most modern I have experienced and definitely does not live up to the standards set by my recent Taiwan trip, but I will cut it some slack for being a significantly older system and compared with the likes of New York, Chicago, or DC, it is downright bright and clean. We got settled into our room, conveniently located near all sorts of transportation options, grabbed some dinner, then relaxed for the remainder of the night. The next morning, my wife headed off to attend her parks tour and I took the opportunity to explore the city by bike. 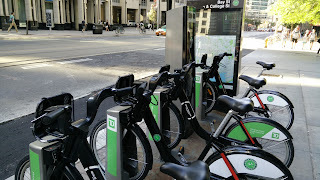 Toronto's bike share system is run by Motivate, the same company that is responsible for the systems in DC, Boston, and Montreal and uses hardware from Monteal-based Bixi, making it very familiar to me. With the trusty Transit app installed on my phone, I was able to locate a station nearby, snag a bike, and set off on a day of exploring. Unlike Montreal, however, Toronto's history with cyclists has been a pretty contentious one. Back in the days of former mayor and crack-addled Humpty-Dumpty impersonator, Rob Ford, the city apparently removed significant amounts of bike infrastructure, to the chagrin of the city's rather large population of cyclists. At points during Rob Ford's administration, bike lanes disappeared overnight, resulting in much confusion and protest. 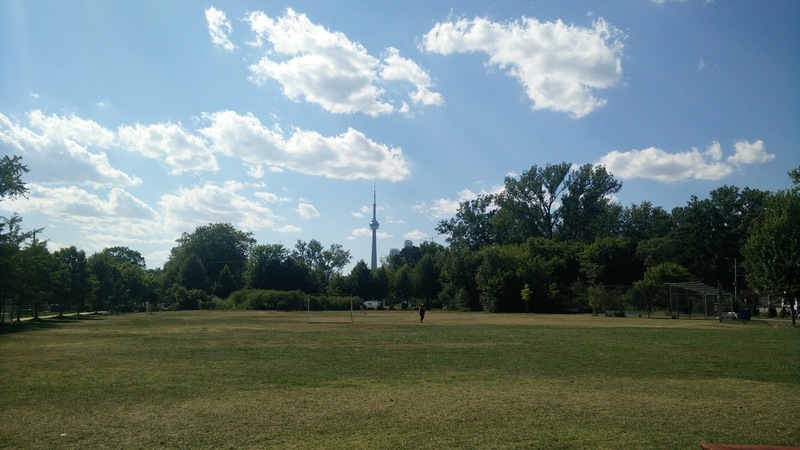 However, in recent years, efforts have been made to restore or improve that cycling infrastructure, but the damage of the Rob Ford years is evident. Some areas of the city sport excellent bike lanes or cycle tracks with smartly implemented cross-over points with public transit, but other areas of the city lack even sharrows and are difficult to reach without spending significant time sharing the road with cars. This would not be a problem, except that the American propensity for terrible driving seems to have had an undue level of influence here in Toronto. Regardless of when I was a pedestrian or a cyclist, I did not feel nearly as safe or as comfortable here in Toronto as I did in Montreal. The driving culture seems to have borrowed some of the least desirable aspects from the US, which maybe should not be that surprising since the border with the US is quite close. Drivers are extremely aggressive and impatient, often entering crosswalks while pedestrians are still crossing or making unnecessarily close passes of cyclists on wide open streets. This led to more than a few sphincter-puckering moments throughout the trip, nearly getting mowed down a few times by drivers, including bus drivers, who seemed none too interested in living up to the kind and friendly stereotype of Canadians. Fortunately, the city redeems itself in quite a few ways for cyclists. 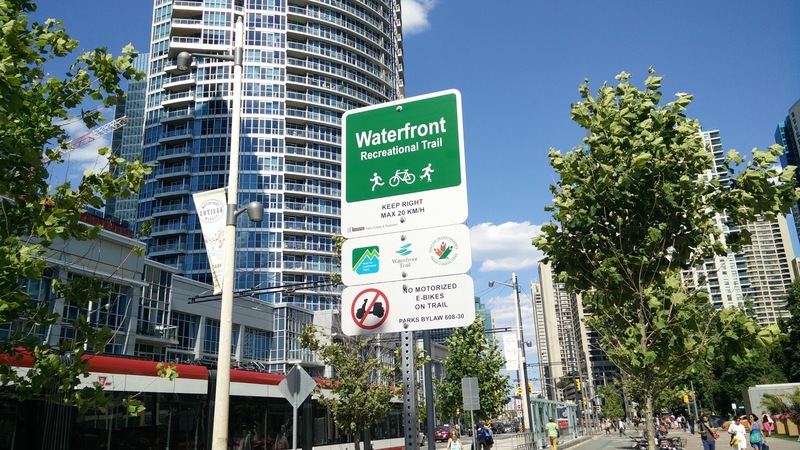 The first is the excellent lakeside bike path, the Martin Goodman Trail, which essentially runs the length of the city from its farther Western edge all the way to the Don River and connects to the Lower Don River Trail, which allows for a significant amount of north-south travel. 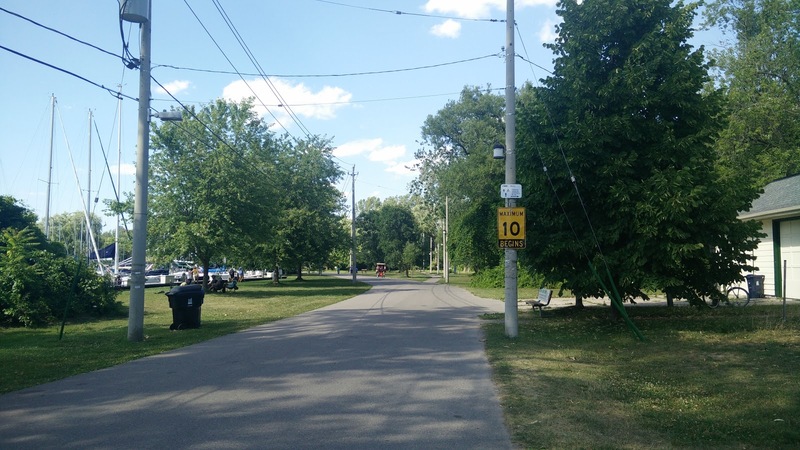 Using this trail, I was able to visit the High Park neighborhood, with its large urban park, miniature zoo, and ethnically diverse residents. 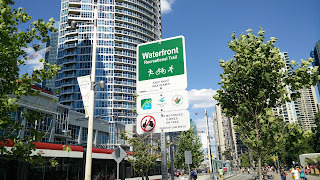 I was also able to spend a significant amount of time biking along the harbor-front, which had its own selection of parks, retail, and great dining. 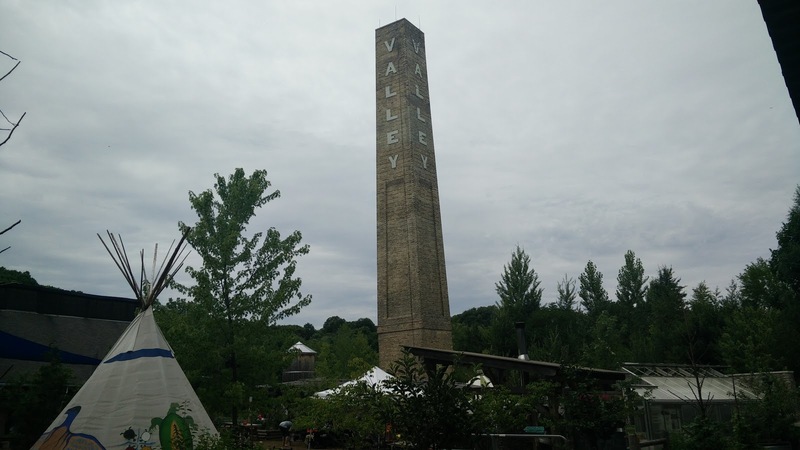 The Lower Don River Trail is generally pretty good as well and highlights much of the natural beauty that Toronto has to offer while also providing glimpses into the city's industrial past. There are only a few things I can truly fault the trails for: some of the transitions are less logical and more difficult than they really needed to be. 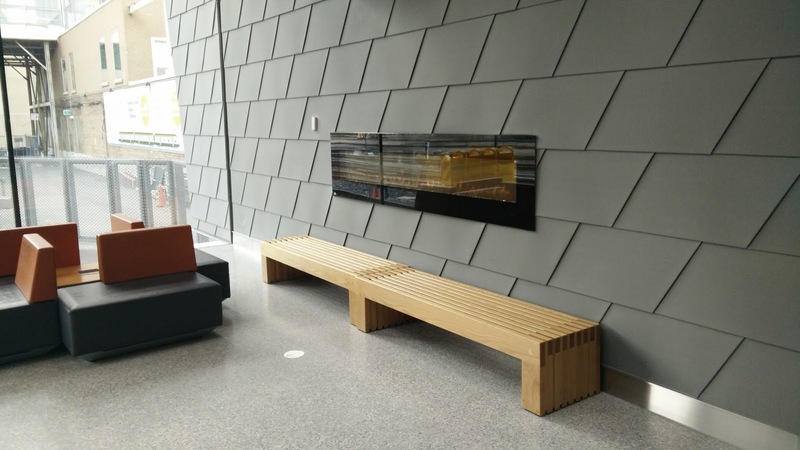 For instance, at several points, it became necessary to dismount and walk up or down stairs where ramps should have been installed. The trails also fail to reach some pretty major tourist destinations without some seriously convoluted running around. Places like Evergreen Brickworks, which is a converted former brick factory that now serves as a community gathering place, conservation site, museum, and park. Locations that are popular with tourist should be made more easily and safely accessible. Luckily, the city is well laid out and is extremely walkable. 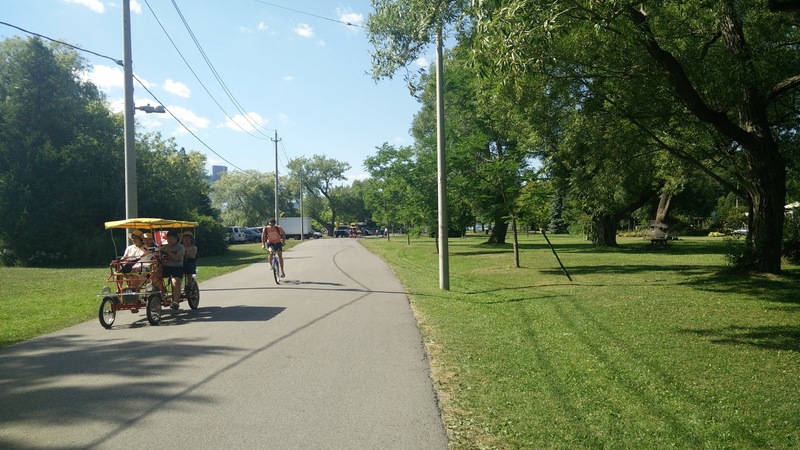 With parks all throughout the city and many of the city's major attractions within a few blocks of each other, a tourist who does not feel comfortable biking could easily walk everywhere so long as they willing and able to dodge the drivers. There are so many wonderful neighborhoods in the city to walk through and, unlike my native Los Angeles, the city is largely very accessible. 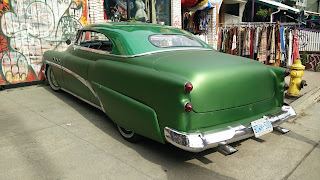 We had the opportunity to stroll through Kensington Market and its many ethnically-themed stores (where I even spotted an old Buick hotrod), the distillery district with its art galleries, the St. Lawrence Market that reminds me so much of a mega-sized Eastern Market in DC, and the Harbourfront Center's many unique outdoor spaces. 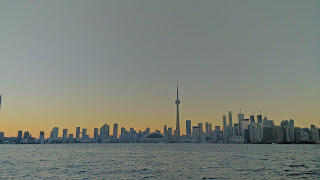 However, probably the most unique experience was to be found a short ferry ride off shore on the Toronto Islands. 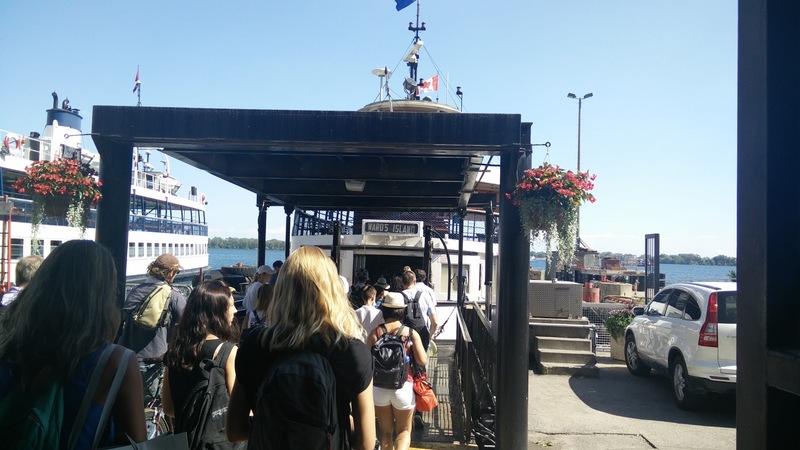 Ward's Island is a small community that is pretty much only accessible by ferry. 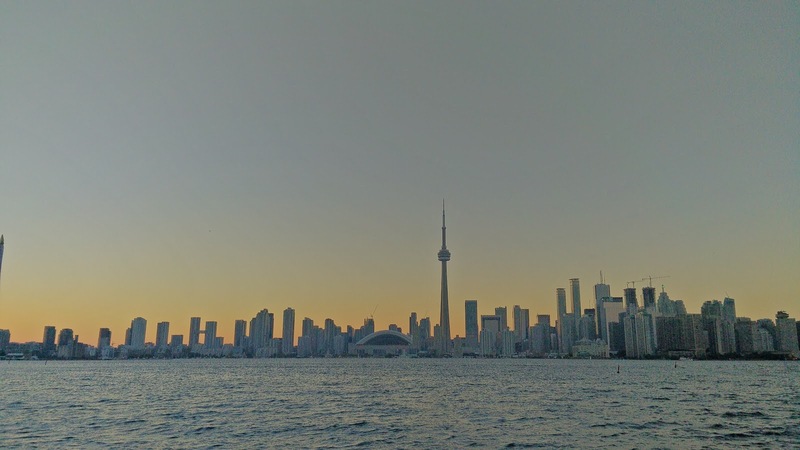 It is the easternmost island of the Toronto Islands and houses a small number of residents who live there year-round. What makes it different from the rest of the Toronto, however, is that most motor vehicles are banned from the roads. Instead, residents pretty much walk and bike everywhere. It is a tourist destination, so the ferry does have the ability to carry a few cars if needed, but once on the island, drivers pretty much have to ditch the cars as soon as the tires touch land. Getting around on foot and by bike makes the entire island feel larger and much more open. Every path allows easy access to the small collection of private residences that dot the island like a work by Jackson Pollack and since the entire group of islands is considered a public park, it is possible to stroll right up to people's property lines. Unlike such islands in the US, such as Martha's Vineyard off the coast of Massachusetts's Cape Cod, the homes on the Toronto Islands are modest and the lifestyle seems pleasantly simple instead of conspicuously luxurious. I am in awe at how comfortable the island felt and could totally imagine myself living there. 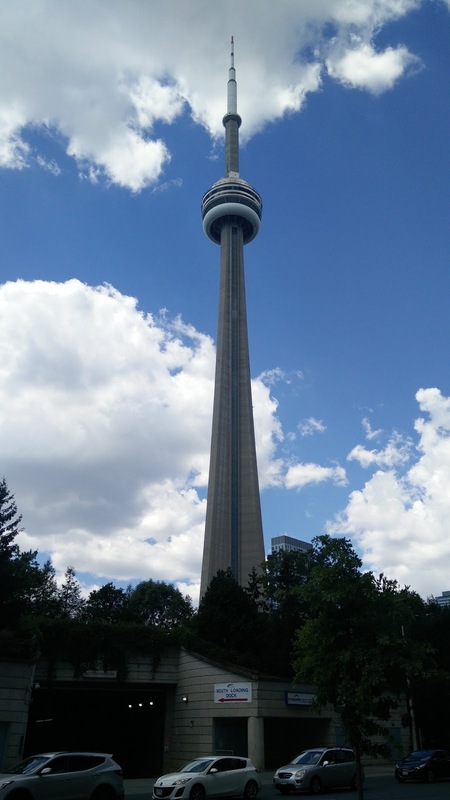 Our departure from Toronto was met with both a modicum of sadness and relief. Sadness at departing from such an amazing city that has done an exceptional job of providing open spaces for its citizens. 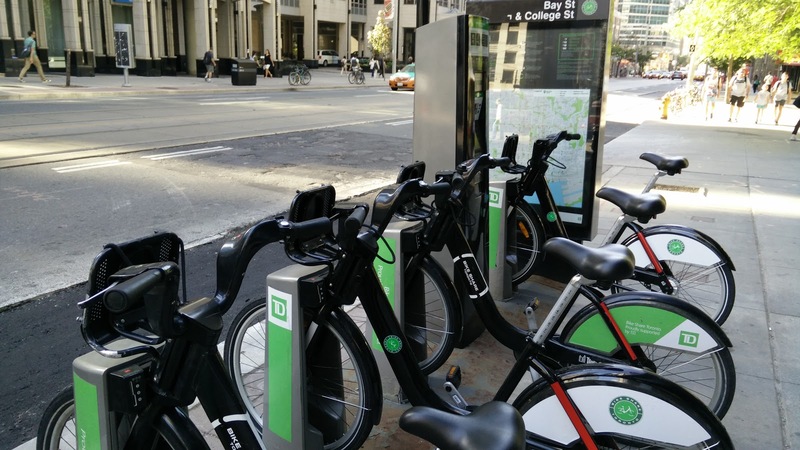 While there were some mistakes made on the active transportation front by the former mayor, his successor seems to be taking huge steps to correct the mistakes of the past. The relief comes from getting away from the drivers, who remind me more of the variety of crazy I encountered in Boston than the more relaxed and possibly substantially more medicated variety we have here in Southern California. Still, the trip was an excellent experience and one that we enjoyed tremendously. Toronto offers much in the way of delights and allows tourists a variety of options for getting around town to enjoy them. We took full advantage of it during the brief time we were there and left with many more excellent ideas to take home with us to ponder.